I’ve detested mushrooms all my life and cringe at the memory of the slimy buttons in chop suey. That is until two years ago when I fell in love with morels. 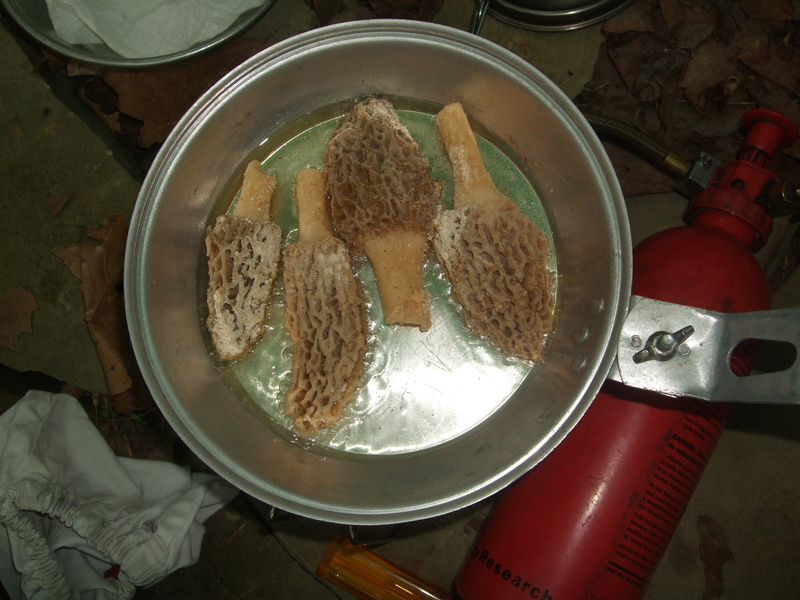 On a backpacking trip to Deem Wilderness in southern Indiana, Doc, a fellow hiker spotted a few of the honeycombed fungi at the base of a tree. He insisted they were delicious and crouched over a camp fire in the rain to saute the mushrooms in olive oil. He offered everyone a sampling. Because the man is a doctor and an experienced woodsman, I pushed away my fear of poisoning, and popped a bit in my mouth. I don’t care a whit about food, except that it stops me from being hungry. That bite of morel, however, was delectable. Thinking of that first bite, makes my nostrils flare and I breathe deep, trying to recall the wonderful flavor. I’ve searched for morels ever since. In early May this year during a backpacking trip to Hoosier National Forest, I didn’t hold much hope of finding the elusive mushrooms because the peak time had passed. Still, for three days as we hiked, I scanned the trail sides beneath old trees for the unique shape of the morel and encouraged the rest of the group to keep a sharp eye. No luck. On the last day back in camp just before dinner, Debra surprised me with a single morel. She had noticed it behind her tent. I grabbed a plastic bag and jumped up to follow her with a search party to the shaded creekside. 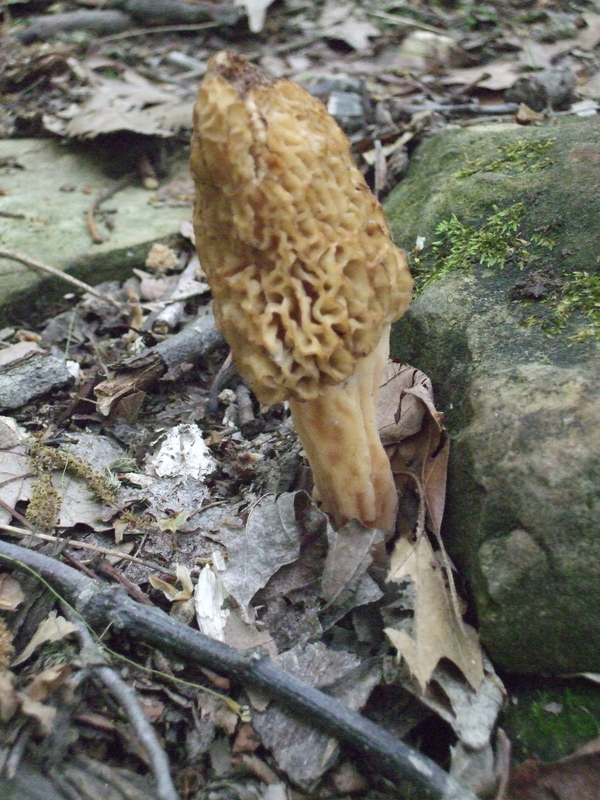 I spotted only one morel, but two of the women had the eye for mushrooms and filled my bag. Anne and I brushed dirt from the mushrooms, sliced them in two and then dredged them in Fry Magic before sauteing them to a golden brown in olive oil. I insisted that we try a few without Fry Magic, but the coating added a wonderful crispiness. Some of the group feared mushroom poisoning, as any logical person might. I tried to allay the fears by saying that nothing looks like the unique, honeycombed morel. 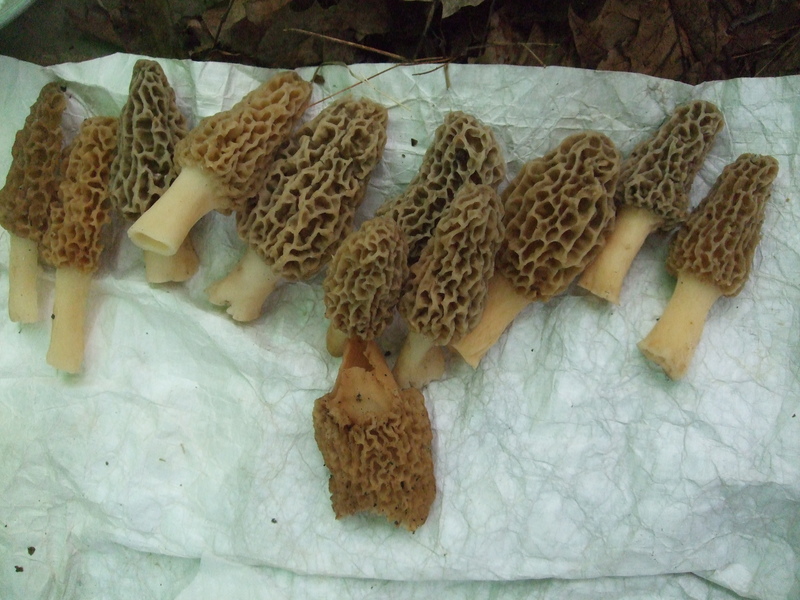 Those who dared to taste the morels were hooked and wanted more. Next year we’ll all descend on Hoosier armed with Fry Magic and olive oil and keep our eyes peeled for the once-a-year (if we’re lucky) delicacy. Next ›Wild Food – Ramps. What’s a Ramp?